TammySantana.com: Cinco de Mayo Sugar Skull Clock Featuring Sabor Papel and Fairfield Oly-Fun Fabrics! 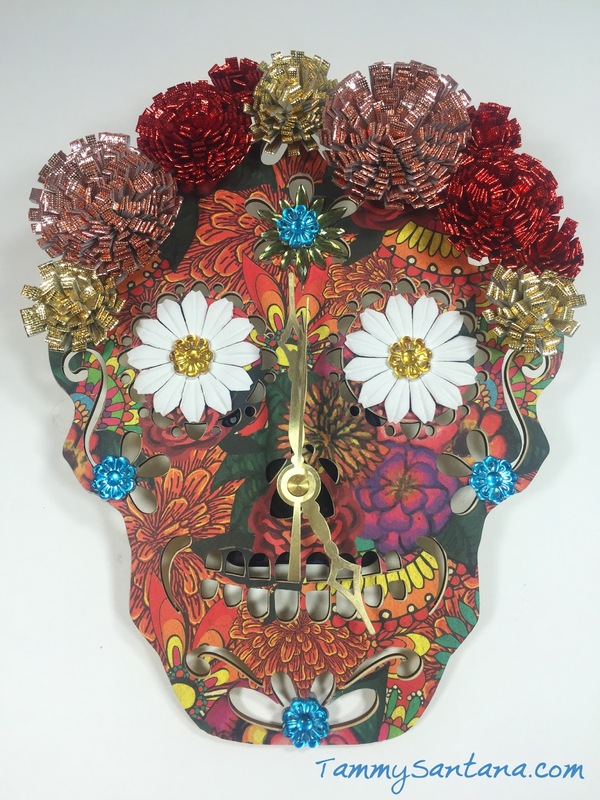 Cinco de Mayo Sugar Skull Clock Featuring Sabor Papel and Fairfield Oly-Fun Fabrics! 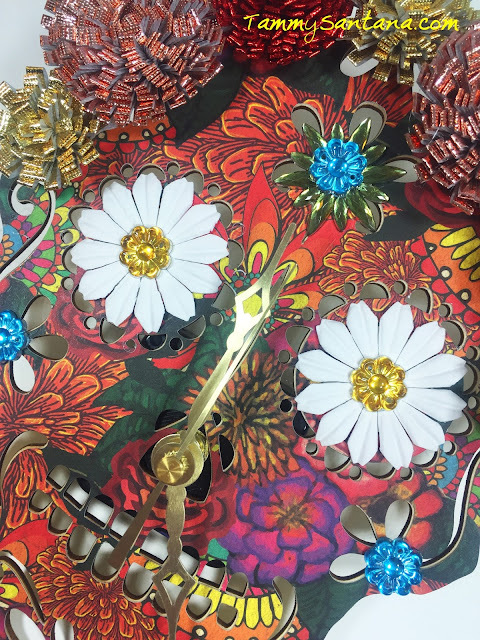 Hi Everyone, Tammy Santana here with a fun and creative clock project for Cinco de Mayo! 1. Lay the Skull Wood Piece on Top of the floral paper and trace the cutouts. Cut out the paper piece to match the base. 2. Attach the paper to the base with adhesive. 3. Cut 2"x 24"strips of the Oly*Fun Metallic fabric and apply Therm-o-web Super Tape on one side of the back side of the fabric and fold the other side on top of the tape. 4. 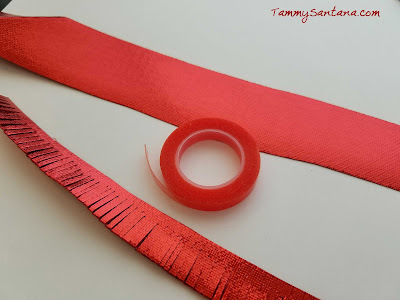 Cut small fringe like cuts into the strip of fabric being careful not to cut all the way through the fabric. 5. 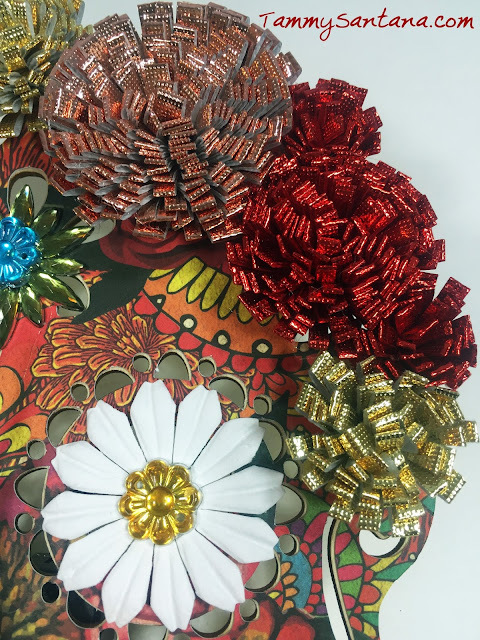 Roll the fabric piece into a flower shape and secure with hot glue. 6. Flip the flower over and press it into the table to separate the pedals of the flower and spread it out a bit. 7. 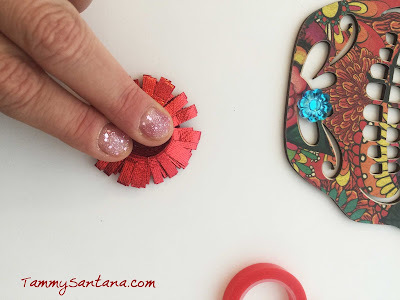 Attach the flowers to the Sugar Skull base with hot glue. 8. Attach the paper flowers on the eyes with gems on top with hot glue. 9. Attach additional plastic gems on the skull where indicated in photo. 10. 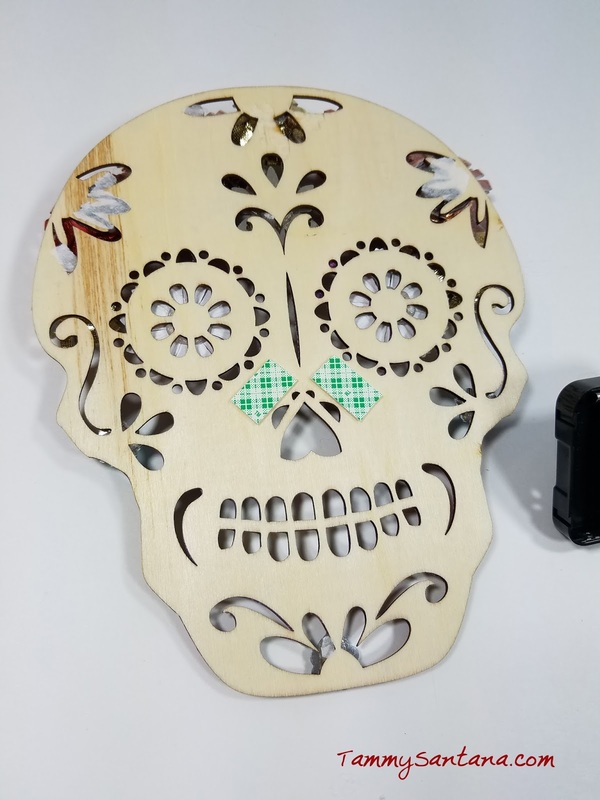 Insert clock mechanism per instructions through the nose of the Sugar Skull and secure with adhesive foam tape on the back side of the skull. That's it, easy peasy! I really love how this project turned out. It really looks like it's Fiesta time! I hope this gives you some unique ideas for decorating for Cinco de Mayo!